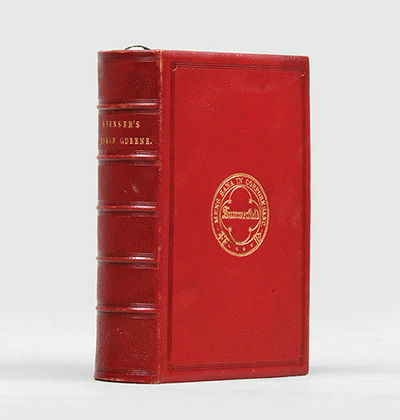 London: G. Routledge & Co.,, 1869. Disposed into twelve books, fashioning 12 moral virtues. To which is added his Epithalamion. New edition with a glossary. Illustrated by Edward Corbould. Octavo (178 x 131 mm). Contemporary red morocco, raised bands to spine, lettered in gilt, triple fillet border in blind with supralibros of Summerfield school to covers, triple fillet rule in blind to turn-ins, marbled endpapers, green page marker, edges gilt. With 7 engraved plates. Bookplate to front pastedown, ownership inscription to binder's blank. Spine very slightly toned, extremities a little worn. A very good copy indeed. An attractively bound copy of Spenser's epic poem, the first three books of which were first published in 1590. They were then republished in 1596 along with books four, five and six. Spencer only finished half of the work he had planned to do on the poem and it remains incomplete, however The Fairie Queene is still the longest poem ever written in the English language.